The project followed an initiative of youth NGO’s to promote European solidarity with marginalized and disadvantaged groups such as refugees and migrants. Involving refugee and migrant organizations as host organizations, the EVS project was a great opportunity for the volunteers to learn about and get involved in working with refugees, migrants and for the defense of human rights. The European and intercultural dimension and the spirit of young persons willing to share and participate brought an added value to the projects. At the same time the volunteers through practicing active citizenship proved that Europe can be an open house where refugees from all parts of the world are welcome. http://icye.org/wp-content/uploads/2016/02/fullname_logo-1.png 0 0 icye http://icye.org/wp-content/uploads/2016/02/fullname_logo-1.png icye2004-06-18 13:34:372016-07-20 14:10:23ICYE Europe-wide Project on Refugees: "Youth and European Solidarity"
The group of 25 participants consisted of both former EVS volunteers and representatives of host organisations working in the area of sexual health promotion and the prevention of HIV/Aids with a focus on youth volunteering. The training course aimed at fostering bi- and multilateral cooperation in EU and Central and Eastern European Countries through capacity building, focusing on the practical aspects of developing and managing international voluntary exchange projects suited to the particularities of the HIV/AIDS prevention sector. This was done by a transfer of know-how on how to develop and manage International Voluntary Service projects combined with HIV/AIDS prevention peer education campaigns, considering more in-depth the variety of prevention strategies related to the respective risk groups. Networking and Fundraising for programme opportunities in East – West voluntary exchanges was another focal point along with the development of innovative forms of cooperation among HIV/AIDS and Youth NGOs in EU and CEE countries considering the differences of HIV/AIDS prevention work in both parts of Europe. This project aimed to foster long-term voluntary service between the participating EU and SEE countries offered young people the possibility to acquire experiences and knowledge about voluntary service and civil society in general by living and working in EU and SEE countries, including for the first time also Macedonia and Montenegro. The volunteers as well as the coordinators learnt from each other and engaged in multiple initiatives promoting youth volunteering and civil society. 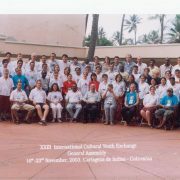 The XXIII General Assembly (GA) of the ICYE Federation was held on the 16th through the 23th of November 2003, in Cartagena de Indias, Colombia. It was attended by some 60 participants representing all the ICYE National Committees, regional bodies and invited organisations. Overall, the General Assembly was a success. The project aimed at building one European identity at grassroots level in EU and SEE countries.5 young volunteers from South East Europe worked in EU non-governmental organisations, disabled care institutions, as well as projects working with refugees and homeless people. At the same time 7 Western Europeans got the chance to volunteer in Bosnian, Bulgarian, Croatian and Serbian non-governmental organisations in conflict resolution, new media, environmental issues and youth work, offering a rich sample of civil society where volunteerism definitely brought an added value to the development of local communities. The objective of this multilateral EVS project was to enhance the participation of Central European Countries, namely the Czech Republic, Hungary, Lithuania, Romania and Slovakia in long term voluntary services between the ICYE and Eastlinks partners. The young volunteers engaged in a range of quite different local hosting projects, ranging from children care institutions, youth organisations to cultural heritage and environmental protection enhancing direct bilateral cooperation between sending and hosting organisations. The involvement of motivated young people in HIV/AIDS prevention projects aimed at enhancing cooperation between themselves and the wider HIV/AIDS prevention sector. The volunteer’s presence added an intercultural dimension to preventative and care work, as well as an input in term of human resources and networking links, which eventually became a source of inspiration for similar joint future projects. In more general terms, this project advocated the cause and visibility of HIV/AIDS projects towards civil society, with a view to promoting a more widespread responsibility in the fight against AIDS across all frontiers. As result of a two year long and very fruitful co-operation, ICYE and Eastlinks deemed it necessary to consolidate and articulate their transnational partnership to promote and further develop youth mobility and international voluntary service activities between EU and pre-accession countries in Central and Eastern Europe in the form of a Large Scale YOUTH project. In order to meet the emerging needs of young people in relation to intercultural learning, volunteering and informal education opportunities in both, EU- and future member countries, ICYE and Eastlinks are intending to strengthen their operational and networking capacity at regional and sub-regional level. In particular, a plan of action was adopted to: organise two major networks’ meetings and a series of sub-regional meeting in the Baltic countries, South Eastern Europe and the EU; enhance the exchange of good practice between relevant community projects and youth NGOs across Eastern and Western Europe; build on ICYE and Eastlinks’ expertise so as to act as resource for community project, and promote and document examples of successful experiences to influence practice and policies around youth mobility and voluntary service activities. According to WHO recent statistics the rate of HIV infections in CEE countries is one of the highest in the world. To illustrate this it suffices to mention that in the Ukraine, for example, every month there are about 2000 new infections, being the average age of the infected population between 15 to 25. Similar scenarios can be found also in other countries such as Estonia and the Russian Federation. This project, which follows on the UNESCO supported Regional Conference on AIDS Prevention and Voluntary Service Organisation organised in September 2001 in Tallinn, Estonia, was an integral part of the ICYE-EASTLINKS Large Scale Project, adding to its scope one urgent and important issue facing young people across the EU and CEE countries. The training events aimed at supporting the implementation of a long-term European Voluntary Service exchange of volunteers – supported by the European Commission – whereby for the first time HIV/AIDS prevention projects in EU countries and Estonia, the Russian Federation and Ukraine were working together. Both the training and the exchange of motivated young volunteers supported the work of respective host projects, as well as demonstrated to the wider society the importance of contributing to the fight against AIDS beyond mental and national borders. Through this EVS multilateral project for the first time ICYE and EASTLINKS were able to offer voluntary service opportunities in EU member countries for young people from CIS countries. Volunteers worked in projects mainly dealing with orphans, and children and youth at risk in Belarus, Russian Federation and the Ukraine, as well as in similar projects (including alternative educational institutions) in Austria, Finland, Germany and the UK. Besides the participating volunteers, the project directly benefitted children and other socially disadvantaged groups catered for by the various hosting projects as well as their staff and local volunteers. The project also enhanced cooperation between sending and hosting organizations, and during its implementation a growing number of returnees from Central and Eastern European countries got involved in supporting volunteers and host projects alike. This exchange activity aimed at offering an opportunity to European and Latin American young people to meet, discuss and share experiences around issues such as social exclusion, violation of human rights and educational opportunities affecting indigenous peoples and ethnic minorities. In particular, participants learnt about resilience strategies employed by indigenous groups against acculturation, struggle for self-determination; they were exposed to various types of activities run by and for indigenous groups, and human rights organisations at large; promoted the participation of youth representing indigenous people in youth mobility and international voluntary service activities. As part of the exchange process, participants learnt to appreciate differences and commonalities of issues affecting indigenous groups/ethnic minorities in Europe and Latin America, as well as the importance of young people’s commitment to promoting respect and more just relations between dominant and minority cultural, social and economic groups.